Why hike to Lookout Point? If you've got a cold and don't want to sneeze in San Francisco's water supply, here's a spot from which you can look down on it, plus the O'Shaughnessy Dam and Wapama Falls, from a safe distance - about five miles. Scenery Summary: Middling. 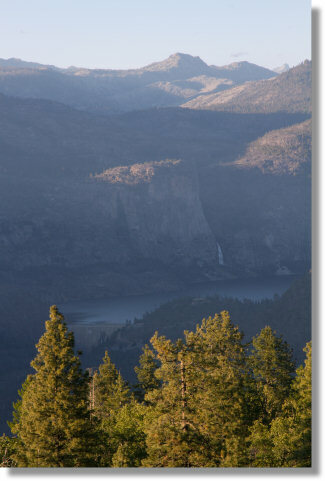 Though the point does provide distant partial views of the Hetch Hetchy Reservoir, O'Shaughnessy Dam, and Wapama Falls, these things are all more interesting from close up. 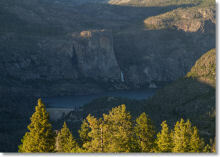 The point also has a 360-degree panoramic view of the surrounding country, but it's not notable by Yosemite standards. To the west you see the land sinking down to the Central Valley; to the east you see it rising to the Sierra crest, but the horizon isn't lined with picturesque peaks here - it's just higher land, for the most part. Yosemite has some amazing panoramic views - Sentinel Dome and Clouds Rest come to mind - but Lookout Point doesn't rank with them. It's still a pleasant hike, though, if you're already in the area and have low expectations and a few hours to kill. Crowd Factor: Low. Any fellow hikers you run into will probably have popped over from the nearby Camp Mather or Evergreen Lodge. If there are other people at the point, they probably won't be there for too long unless they've brought a few bottles of wine, because the scenery really isn't impressive enough to keep them around. Difficulty: Low. It's a short trail that climbs steadily, but not steeply, to the point. Best Time to Visit: May through mid June, give or take a bit, when there should be plenty of water going over Wapama Falls and lots of wildflowers lining the trail. Parking: There's a pullout across the road from the trailhead that can hold four cars. If it's full, mention to the gate attendant that you want to hike to Lookout Point (the pullout is readily visible from the Hetch Hetchy entrance gate tollbooth) and he should be able to clear you to park at one of the buildings on either side of the road here. Bearproof Storage Lockers: Across the road from the trailhead. Nearest Bathrooms: At the Evergreen Lodge, two miles back the way you came. Nearest Snacks: There's a small general store at Camp Mather, a mile back, and another one two miles back at the Evergreen Lodge, which also has a restaurant and bar. Getting There: Evergreen Road, which begins a mile outside the park's Big Oak Flat (Highway 120/northwest) entrance, is the route to Hetch Hetchy. Roughly eight miles along, Evergreen Road reaches a T crossing at Camp Mather. Turn right at the T and you'll reach the Hetch Hetchy admission tollbooth in a little over a mile. The trailhead is just past the Hetch Hetchy admission booth - there'll be a building on the right, and the trailhead is just the other side of it. Parking is at a pullout across the road from the trailhead, next to a pair of bearproof (so far, at least) food storage lockers. Getting Locked In: Yosemite, in theory, never closes. But the Hetch Hetchy area is an exception. There's only one road in, and the gates get closed at night - typically at 9 p.m. in the summer and earlier in the winter. If you haven't left by then, you'll be marooned for the night. Call the Yosemite road conditions line (209-372-0200, enter 1 at the first two voice prompts) to learn the current closing time. The gates, incidentally, aren't at the little booth where they collect your entrance fee, but a mile west near Camp Mather. Miscellaneous Trail Notes: Whenever you reach a fork in the trail, take the left one, and you will eventually arrive at Lookout Point. You'll have to pass through a pair of V-shaped gates along the trail. The second one could be a bit tight if you're wearing a bulky backpack, but really shouldn't be much trouble. The first one, though, just past the trailhead, seems to have been designed to force people to strip naked and slather themselves with lube so they can squeeze through. There must be a webcam nearby. The sign at the trailhead says that Lookout Point is only a mile away, but according to GPS, it's closer to a mile and a half. Trail-sign mileages in Yosemite should be regarded as estimates, in any case; they frequently disagree not only with Yosemite maps, but with each other. The trail appears to head into the wilderness, but it actually turns left and parallels the road for the first third or so. It can be a bit startling to sink into blissed-out-hiker mode for ten minutes or so and then round a corner to find the road within a stone's throw - underhanded - of the trail. Though this will be less surprising if there have been any cars on the road. Poison oak lines one short stretch of the trail about midway along. Depending on how early in the year you hike, you could have a handful of small streams to cross; the last two are in a generally marshy area and should be crossed with dispatch unless you enjoy providing target practice for mosquitoes.